Seldom does one come away from a theatre with such a feeling of such complete satisfaction as from The Corps Ensemble’s production of Mark O’Rowe’s Made in China. We are in working-class Dublin, looking in on the lives of three young men leading disordered lives, wracked by self-doubt, guilt, misguided aspiration and marked by an overall quiet desperation. Initially they strike us as probably comical, one-dimensional cyphers. However, we spend the rest of the evening revising facile judgements and expectations until in the end we don’t know what to expect and are ready for anything, feeling we have been wrung out. Even the few compulsive gigglers in every audience who feel that each swear word or sexual reference is hilarious have been subdued into tense silence. The three are caught up in a violent struggle between two rival characters or gangs, intent on ruling their patch through intimidation and downright terror. They are motivated by the need to assert their macho supremacy and by revenge for past slights and betrayal. However, they are not cyphers; our sense of waste is deepened by flashes of warmth, loyalty and human need that pull us back from dismissing the three characters or feeling they deserve whatever life metes out to them. Nor is the evening relentlessly grim; there is a lot of humour running from a hilarious Nik-Nax running gag to unorthodox use of a prosthetic limb. While these three bottom-feeders swim in the same shoal, they are at different depths in terms of their humanity, intelligence and capacity for human sympathy. With his superficial joviality and posturing, Neill Fleming’s Kilby dupes us into seeing him as not too bright but harmless enough. He struts around, asserting himself as a kind of priapic alpha-male, but his misogynistic and homophobic remarks seem to mask a twisted, pathetic, inadequate individual, scarred literally and metaphorically by a horrific and humiliating ordeal. His mood can turn in a split second and we realise he is capable of chilling, psychopathic violence. It is an outstanding performance. Edwin Mullane’s Hughie, whose dead mother is almost a fourth character, is driven by a strong instinct for self-preservation which, in this setting, has to be propped up by occasional bursts of macho bravado At a deeper level, however, he is capable of empathy and even tenderness, especially in his attempts to shield his younger friend. He is intelligent and streetwise enough to see where staying put will eventually take him and eventually breaks away. It is a demanding part, carried off to the letter by Mullane. Rex Ryan’s naïve – almost innocent – Paddy is torn between conflicting impulses and loyalties. His deepest need is to be accepted, affirmed as an equal. This is an astonishing performance, capable of extracting a laugh and breaking your heart in the same line. While “definitive” is a word to be using sparingly, you are unlikely to see a Paddy to match this, nor a production to surpass this one overall. It is a measure of O’Rowe’s writing and of the superb performances that you find yourself sketching in a whole back-story to the characters’ lives. What made them as they are? Typically, O’Rowe tantalises us: what did Nick’s mother say to Paddy… what is the difference between “so long as we were friends and “so long as I was yours”. A play like this shouldn’t normally fit into the confines of the Viking but the alchemy of set design (Katie Davenport) combined with Jed Murray’s superb direction and the fight choreography by Ciaran O’Grady means that it actually seems made for the space. 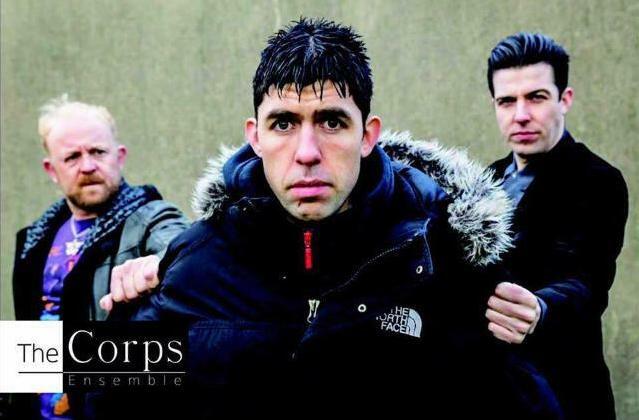 This is powerful and compelling theatre and gets The Corps Ensemble’s residency at the Shed off to a triumphant start. I urge you not to miss it.